Why does Iris West have purple lightning? In the recent episode of Flash, Iris briefly became a speedster thanks to some switcheroo between Flash and Iris. Flash usually has the colors Red and Yellow. But Iris had different colors in her. Is there any (preferably) in-universe explanation for why Iris has purple lightning? In-universe, blue color has been considered dangerous since it is associated with the speed drug. So is there any significance for this color in terms of effects or is it just for show (albeit a good one)? but we don't know what it is yet. "There's a specific reason we designed the costume the way we did," executive producer Todd Helbing says. "There's a specific reason for the jacket." Helbing also notes that the choice to make her lightning purple followed along the same lines as the jacket, but it's something we'll have to wait for answers on. At least for now, we can start trying to connect some dots with what we do know about speedster colors and Iris. In the history of the show, there's only been one other speedster who left a trail of purple lightning in his wake. 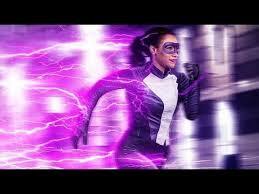 When we briefly visited Earth 19 with Gypsy last season, she flipped through photos, one of which was a speedster who zipped away in a flash of purple lightning. Some quick comic research reveals his identity to be Accelerated Man (the Earth 19 equivalent of the Flash), but so far we have no clue as to why certain speedsters emit purple lightning or why that may be important. In the comics, there are instances of different color lighting being related to different speedsters and has generally been associated with their ultimate top speeds. Additionally, in, I think, DC Rebirth, Barry & Iris children ( & grandchildren?) who are also speedsters have purple lightning. But you know what the costume does look like? The comic book incarnations of both Dawn Allen, Barry and Iris' daughter, and Jenni Ognats, Barry and Iris' granddaughter, the two main theories surrounding the [in-show] mystery girl's identity. Dawn, as part of the Tornado Twins with her brother Don, wears a weirdly futuristic superhero costume in several of her comic appearances. The costume has black pants (like Iris'), and a purple-and-white top. Jenni, who operates as the Legion of Super-Heroes member XS, also wears a purple-and-white ensemble, and the white portion of the costume does bare a similar shape to what's seen in Iris' suit. Not the answer you're looking for? Browse other questions tagged analysis arrowverse the-flash . Against whose DNA does Cisco match? How does Central City PD jail metahumans? Why doesn't the Flash have lightning fast reactions? Do “Flash” and “Legends of Tomorrow” have different rules for time travel? How does that private prison in The Flash work? Why does the Flash's speed not affect people or objects? Why does lightning hit affects speedsters? How could Goldface have survived?